The Appspace Core 5.4 build is a planned update that focuses on platform optimisation, enhancements and the latest bug fixes. 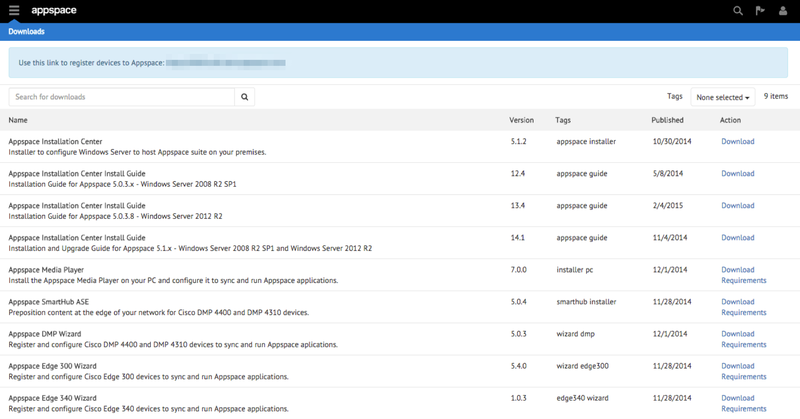 This build was released on February 14th, 2015 and covers Appspace Cloud. The simplified user interface immediately shows all users within the selected network with improved status information. Improved user invitation interface and workflow. Streamlined group filtering provides a more intuitive navigational experience. All software downloads are now categorized centrally under the Downloads extension. A filter allows you to filter download types to quickly access installers, wizards or user guides. AE-618: Server error when registering a new account. AE-965: Users are not given the option to delete assets from a media zone. AE-1149: Device sync status not displayed. AE-1168: Users are unable to change networks. AE-1190: Runtime error when creating a new account for multi-tenanted environments. AE-1216: Fail to add and/or remove specific users. AP-4219: Error when creating a new account. AP-7241: Non Omni subscribers are able to view the message box (in yellow) under the Licenses tab. AP-7242: Fail to automatically update licensing with new sub key. AP-7243: Statuses of all perpetual licenses for user with an Omni subscription should be inactive. AP-7244: Add-on key checkbox within the Licenses page missing. AP-7283: Hardware server information unavailable in dialog box. AP-7141: Copying a Data Only app saves the app as a Sign Manager app. AP-7335: Custom font size for table listing widget is set to -1px. AP-7528: Content allocations are not deleted when related user group is deleted.